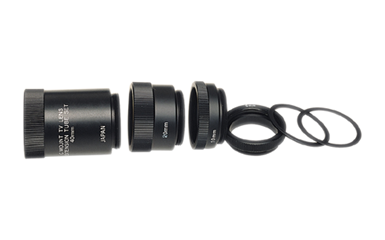 Extension Tube Kit allows to be focused on an object that is nearer to the camera than the normal lens focus movement provides. Extension Tube Kit is consists of 6 metal spacers and barrels of the following length (0.5mm, 1mm, 5mm, 10mm, 20mm and 40mm). By using these individually or in combination between the lens and camera, a C-Mount or CS-Mount lens can be focused to accommodate a large range of object distances. View the Specification Sheet for a complete table of object distances.